This content has been removed by a moderator. I like Kim Soo Hyun but Shin Ha Kyun (Brain) should have won Best Actor. Come on just because KSH is the hit guy of the moment, should not cloud the decision making. I agree with you all. Shin Hakyun is flawless. It's a pity he didn't win. KSH is without a doubt great too but after I saw Brain, I was in awe throughout SHK's scenes. who will present the award for Daesang? 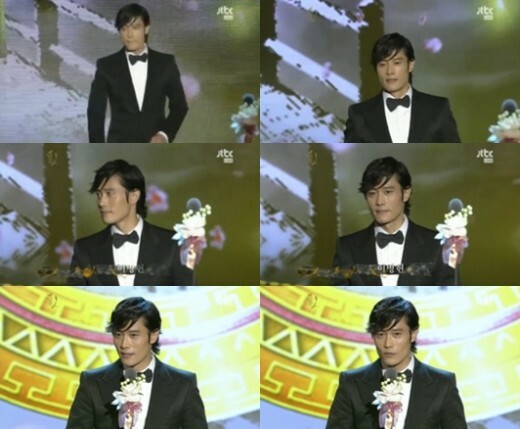 Last year's Daesang winner (movie category), actor Lee Byung Hun presented the awards for both TV & movie section. YES!!! Kim Soo Hyun won an award finally! I was so disappointed that he didn't win the best rookie award last year, although I knew that Yoochun was a strong contender for that award. When I had read that he was nominated for best actor this year, I wanted to him so badly. I'm so happy that he won. To one of my favourite actors, congrats on the award! I hope to see him continue to do well in acting. Congratulation to all the winners and actors/actresses in Baeksang Arts Awards today! To be here is a big pride so do not feel sad or jealous even without awards! Congratulation to Kim Soo Huyn! My King, you absolutely deserve this. Ready to fighting agaisnt criticism comments starting from now and do your better job! For Yeo Jin Goo & Kim Yoo Jung: Feel a little bit regret for both of you! You look admire and really happy for KSH! You are a good team! Lovely kids, 8 years later or sooner both of you will receive greater awards and get oppa's admiration exactly like this way! hehhehe... Your time sure will come soon! Btw, the fact that Yeo&Yoo didn't get the awards maybe the good thing. You know, i mean the pressure! If they get the big awards means they have to work harder and it will make them exhausted while their age should only play and learn! So, it had better let them grow their talent naturally and freely! I think through this event, they will have more motivation to act better! I love to see them with great awards in near future! Cant believe they are just 13-15! Their acting is so so so touching and﻿ excellent! I love them then I love Moonsun then I love K-drama! Maybe this time they are still so young to get the prizes but... They are really greater, even greater than best new actor & actress today! Fighting! Same here! I'm not blaming KSH on this... But when you talk about SHK here. It's better if SHK won the best actor award. I'm very upset bec. of the airing of that award last night. It's a big problem for me to watch live streaming in your laptop with buffering on it. Blah! 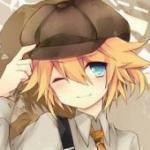 :| Like my mom said, "It's impossible!" 3 in 1 - he get to show his talent in this 3 type of acting skill in one drama. Agree with you and sure based on rating , his drama was the hit may be over last 2 years .. I do not remember a drama from 2011 had a high rating like this one or King of baking on 2010 ! U think the same to me! Me too felt regret for Yeo Jin Goo & Kim Yoo Jung for not get the awards because their acting is so so great! But after reading an article saying that some netizens doubt KSH qualification by Baeksang’s Best Actor Award because he is just 24 years old to win over other senior actors, I am happy that our young royal couple did not get them. They are too young to endure such biased criticisms like their oppa KSH. I cannot imagine that if they 3 all get awards, how many biased criticisms will hurt their young hearts? So, even I am not KSH fan (I just love Jin Goo & Yoo Jung), I do feel free to congrats his award because I think he deserve it and I wanna send this sharing to him: Fighting, KSH! Fighting for Yeo Jin Goo, for Kim Yoo Jung, for TMTETS and the young ones! Prove that youngers can also make great things! P/s: Like you, I congratulate all the actors actresses who were nominated in Paeksang Arts Awards no matter they win awards or not! They are all excellent actors and the prides of Korean! I think these results refute the myth that the Baeksang awards are different from other awards shows because they don't pay attention to ratings success during their nomination process. Yeah, right. As talented as I think KSH is and as much as I enjoyed him in Moon/Sun, his winning this award made me feel kind of uncomfortable for him because his performance in MoonSun wasn't in the same league as some of the other actors in this category. I think he is talented enough to win an award based on his own merits, so having him win here because Moon/Sun was a massive hit is disappointing. If Moon/Sun had received average to low ratings, Baeksang would never have acknowledged the show. Because I think the writing for Moon/Sun was weak, I don't have a problem with that. However, I do have a problem with the way Baeksang and other awards shows tend to ignore good, well-written shows and excellent performances by the actors in those shows because the ratings weren't high enough. I wouldn't be a bit surprised if KSH turned in an even better performance in a future show, but was ignored by Baeksang because the ratings for that show weren't high enough. To make matters even worse, the Baeksang's had the nerve to choose MoonSun as the best TV drama. I mean... really? Is there anyone who seriously believes that MoonSun would even have been nominated if it had gotten low to average ratings? Even some fans complained about many of the problems with that show. The only good thing about these results is that more people now realize the truth, that the Baeksangs are based on ratings, so they won't be too disappointed with the nominations and results for the Baeksangs in the future.